2016 Florian Roblin Vigneron, Pinot Noir/Gamay, Coteaux du Giennois Rouge “Champ Gibault” Loire Valley, France. This appellation on the eastern edge of the Loire Valley northeast of Sancerre produces almost equal amounts of light-bodied red and white wines, with a small portion of dry rosé as well. The 2016 Champ Gibault Coteaux du Giennois Rouge is 80% Pinot Noir, 20% Gamay, that is native yeast ferment then aged in neutral wood as well as some raised in stainless steel tank​, making for a very pretty and detailed wine. 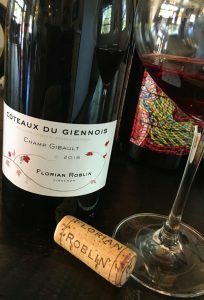 The Roblin Champ Gibault Coteaux du Giennois Rouge 2016 is pure and Pinot driven, it feels and tastes like a minerally Burgundy with just a hint of bright and Juicy Gamay, it’s delicate and natural with layers of floral and light red berry notes. The round of silky palate shows a textural array of cherry, raspberry and strawberry along with a touch of chalky stones, vibrant acidity in the form of lift and lightness, adding wilted rose petals, faint wood vanillin and snappy spices. This Wine impresses for it’s subtle and satiny personality, it has a lot of class and style, especially for the price, it’s lovely ruby/garnet hue is seductive in the glass and the Pinot structure, flavor profile and elegant form delivers a wonderful and expressive performance worthy of any wine enthusiast’s attention. Drink this graceful beauty over the next 3 to 5 years, it certainly is going to be great warm weather red to enjoy with picnics, Summer meals, but don’t sell this lighter red short, it will provide a wonderful experience even on more serious occasions.